Picture yourself on the edge of an airplane, 18,000 feet above Monterey Bay. What happens next is difficult to process. You fall and begin to accelerate to 120 mph, falling a thousand feet every five seconds; yet it feels like you’re floating. You feel the energy of human flight and in this very moment, you are completely free, ecstatic and powerful. For most people the details of skydiving are fairly foreign. After all, not everyone jumps out of a perfectly good airplane. You probably have many questions, maybe some concerns, maybe even some second thoughts. We understand. We were there once too. We’ll help clarify everything about skydiving. We want you to have a fantastic experience and that includes understanding with the highest skydive jump in the Bay area. We’ll start you off with a tandem skydive for your first jump. 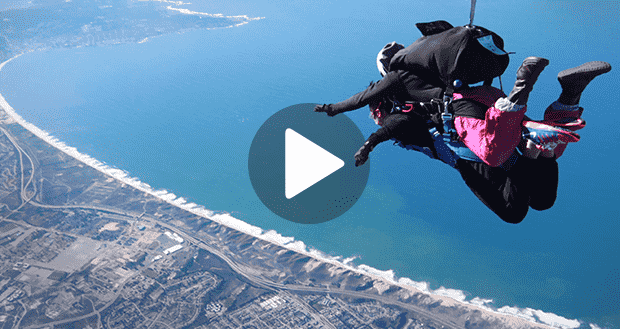 We offer a variety of skydiving packages so that you can customize your first jump to be exactly how you want it Regardless of which package and experience you choose, you’ll enjoy the world’s highest skydive when you book with Skydive Monterey Bay today.